New orphans that come into care are sometimes dehydrated and malnourished. Is the skin supple or does it tent? (pinch the skin on the back of the neck, does it go back straight away or does it recede slowly (tent). Are the eyes sunken, dull, lifeless, are there hollows above the eyes? If your baby is dehydrated it will need extra fluids for the first day or two. Be aware that a dehydrated orphan may not want to drink milk. Milk formula is a food supplement and will not re-hydrate. Give Vytrate or Lectade. If this is not available remember: 1 cup of warm boiled water, 1 tspn sugar and a pinch of salt works just as well. This can be made up and kept in the fridge. A little often is best and let your baby show you what it needs. Once the orphan is re-hydrated then it will be able to take food (milk formula). Don’t confuse milk with re-hydrating fluids. A dehydrated orphan needs electrolytes (as above) before it will be able to absorb food (milk formula). Remember to treat for dehydration first and then milk formula to treat malnutrition. A dehydrated joey may not be able to drink milk formula for 24 hours. If you can’t get the orphan to take fluids it is important to seek help immediately. Most joeys can be re-hydrated orally but if you are having trouble contact an experienced wildlife carer or your local vet. Subcutaneous fluids may be needed. If a new orphan is reluctant to feed – this may be due to the stress of coming into care and being handled and of course having to deal with a new milk formula and teat. It can also be the result of dehydration. This is why it is important to get as much information about the new arrival as possible. When Elle was orphaned she had been kept by a member of the public for over a week so children could play with her while they were on school holidays. This little wombat was lucky to be alive. When she was eventually handed into a wildlife shelter Elle looked very sick and malnourished. 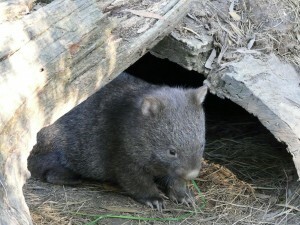 The carer at the shelter was concerned that the little wombat wouldn’t drink the milk offered to her. Elle was so dehydrated she couldn’t drink milk, she needed water/electrolytes to re-hydrate her. 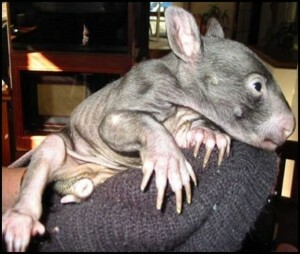 At this stage it was a life and death situation, left much longer without fluid, the little wombat would be beyond help. Luckily the shelter operator sought advice and little Elle was given the much needed fluids to re-hydrate her and then after 24 hours she was able to start to digest the milk formula. Elle also had Thrush brought on by stress, this added to the problem as she had difficulty swallowing. The Thrush was treated with Nilstat (available at the chemist). Slowly over the coming weeks she started to put on weight. In cases like this it is best to offer a little often as the wombat will be very weak and unable to digest large amounts. This can be gradually increased as the wombat regains strength. Elle made a full recovery and has since been released.